glasses | Oh Happy Dae! Posted in shopping	by Oh Happy Dae! Chances are, during your stay in Korea, you’re going to need new glasses or a haircut. You may be the kind of adventurous person who doesn’t mind the language barrier and will bravely head out to whichever shop strikes your fancy. When I came I went to a hair salon by the name of Kim Shin that had 1 girl who could speak decent English. Unfortunately, she moved back to Australia during the summer so I went without a stylist for awhile. My co-worker gave me a heads up about a gal named Seung Ah at the Lee Chard salon (you’ll see *tons* of these around) near Tanbang station in Daejeon. I must say I love this location. They always treat you well. The decor is rather fancy-schmancy. The best thing is that it’s so cheap. Haircuts will run you about 12,000 won. I just got my hair colored and bangs trimmed for 44,000 over the weekend. You can get there a few ways. 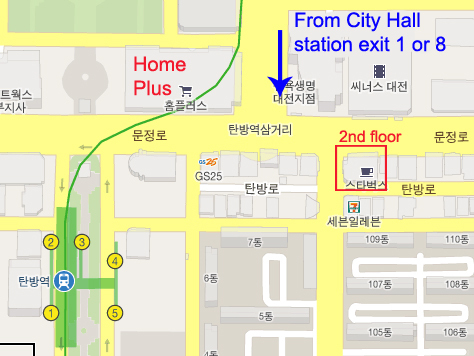 – City Hall station – go out exit 1 or 8 and walk straight for about 5-10 minutes. When you see the Home Plus cross the street and go left. There’s a Coffee Bean cafe on the ground floor, and Lee Chard is on the 2nd. – Tanbang station – exit 3 – walk straight a bit and turn right. It’ll be on your right. – Taxi – you can say “Tanbang yeok [station]” or “Tanbang Home Plus” (note: the last time we said that the driver seemed a little confused, but when we said “Tanbang station” he knew where to go). Last time I picked up glasses and contacts I went to the Yuseong Home Plus near my apartment. They didn’t speak much English, but I had my prescription from home, so it was only a matter of picking a pair I wanted, waiting about 20 min, and paying. Not bad. This weekend, however, I decided to look for another place. I figured I needed my prescription updated anyway. The process was very easy. They have a number of showcases with different kinds. You’re free to pick out whichever ones you want and try it on. The optometrist spoke a little English which was great since he checked my eyes while I was there. By the way, if you didn’t already know, glasses are incredibly cheap in Korea. I got 2 pairs of glasses for 105,000 won (about $105) total — total. There was a sale on lens that day, so instead of paying 60,000 for 2 I got them for 30,000. Dang yo. I just had to wait until the next day to pick them up. [EDIT] Since writing this post, Taeguk Optical has moved/closed. I haven’t been to another glasses store yet, but when I do I’ll make a new post. In the meantime, I’ve been told Davichi over by City Hall is supposed to be good.